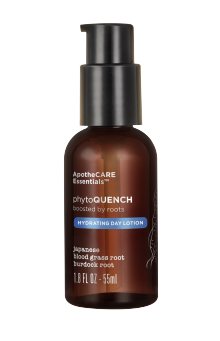 PhytoQuench day hydrating lotion instantly boosts skin's moisture reservoir for a full 24 hours. No Parabens. No artificial dyes. No petrolatum. No propylene glycol. Formulated without phthalates. Japanese Blood Grass, included at active levels, is known as a survivor plant. Its roots trap water and hang on to it, maintaining appropriate hydration even in sandy or salty environments. Apply like a face moisturizer generously over face and neck. Lightweight, highly absorbent and non-greasy, leaving skin residue-free. 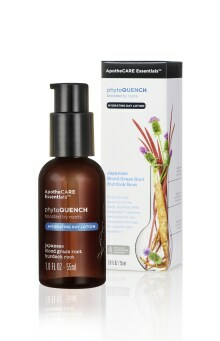 Maximize hydration benefits by using after PhytoQUENCH Replenishing Serum. Roots are the reservoir of the plant. ApotheCARE EssentialsTM captures their essence into advanced formulas for superior skin hydration. Shea Butter doesn’t just have a rich texture; it is known to be incredibly nourishing and moisturizing for skin, while reducing inflammation. Rosehip Oil is known to be a natural elixir for fine or thinning hair. It is used to promote growth, health, and vitality with its hydrating and moisturizing properties. Native to Asia, from Japan to Iran. Used as a remedy to energize skin, to visibly reduce the signs of skin fatigue. 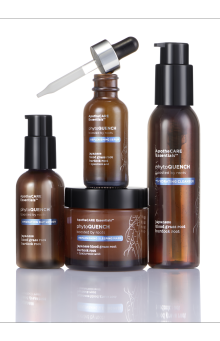 PhytoQuench Hydrating Day Lotion is rated 4.4 out of 5 by 70. Rated 3 out of 5 by emique from Nice consistency, overpowering scent I received this complimentary product through Influenster, and was excited to try the PhytoQuench line. In my opinion, this lotion is better suited to summer or spring use because it is light weight but still hydrating. I don’t think it would be very repairative on already dry skin. The texture is great and absorbs well. My only issue with the lotion was with the added fragrance. The cleanser, serum, and lotion all had the same overpowering fragrance, which was surprising given the list of “free from” items on the product description. i wish I could have overlooked the scent, but sadly couldn’t keep using this after a couple tries. Rated 5 out of 5 by Daisies803 from Lovely lotion I've been using this lotion along with the cleanser and serum for about 2 weeks. I received the products from Influenster in a Voxbox. I have really enjoyed using these products and look forward to future use. It only takes one pump of this lotion to easily cover your entire face. If you're using it on your neck and chest area, it would take another pump. On the days that I don't wear any makeup, this has kept my face moisturized all the way through bedtime. I keep seeing comments about the smell but I find these products have a very mild fragrance to them. Not bothersome at all. I have been truly impressed with all of the Apothecare Essentials products. Rated 5 out of 5 by Willamil from QUENCH INDEED! If you have mature, dry, and delicate skin and are tired of having to layer on the heavy creams for moisture and treatment stop right here! PhytoQuench Day Lotion is the first truly lightweight gel cream that soothes my skin after cleansing. I use it on my face and neck after the serum and my skin could not be softer and free of excess “grease.” It’s treatment properties are far superior to my previous creams I believe because of the “targeted” benefits of the deep skin hydration. And last but not least the bottles are genius! No caps to open and close, the pumps simply twist open and twist to close. LOVE IT! I received this product free for testing purposes. Rated 4 out of 5 by Whitney from Influenster Review I received this item from Influenster in exchange for my honest review. I’d never heard of this brand so that’s always exciting to try somerhing new. I really enjoyed the earthy scent that didn’t have a very strong fragrance. The packaging and overall look is high quality like something you’d get in a spa. I was very excited to see this was targeted for dry skin, but felt the lotion was extremely lightweight and during the winter months my skin may need just a little more moisture. However, it is a day lotion which is nice to have your skin not get greasy especially if wearing makeup. It also absorbed into my skin very quickly, but still felt dry yet very smooth. Rated 5 out of 5 by Kelly8112 from 24 hour hydration I received this item as part of a promotion and would definitely repurchase. 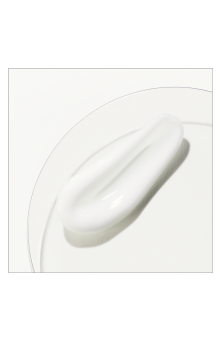 After using, my skin felt deeply hydrated and dewy. I normally need to reapply my moisturizer during the day as I have chronically dry skin and live in a dry climate, but not with this moisturizer. A couple of pumps in the morning lasted the entire day. Oh and the smell. I’m not a fan of fragrance in my skin care products, but the smell of this cream reminded me of being in a high end spa. If you suffer from dry, flaky skin and your usual moisturizer isn’t cutting it, I highly recommend you give this a try. It seriously compares to the $200+ creams in my arsenal as far as hydration goes. Rated 5 out of 5 by Mystemae37 from This Lotion is Great! I use this lotion after cleansing with the hydrating cleanser and applying the replenishing serum in the same line. Wow! This lotion smells so amazing, like I stepped into a day spa. After allowing the serum to soak up in my skin I apply the day lotion. I use one to two small pumps of the day lotion, it smooths on wonderfully and absorbs quickly. I actually have been using it day and night, just because I love the scent! After absorption I apply my makeup as normal. I do sometimes get a little oily by the end of the day but that could do with combination of my BB Cream. My skin feels very hydrated all day! I received these products complimentary for testing purposes from influenster.